A recent press release from NASA states that the Mars Rover Spirit will no longer be a mobile research platform. 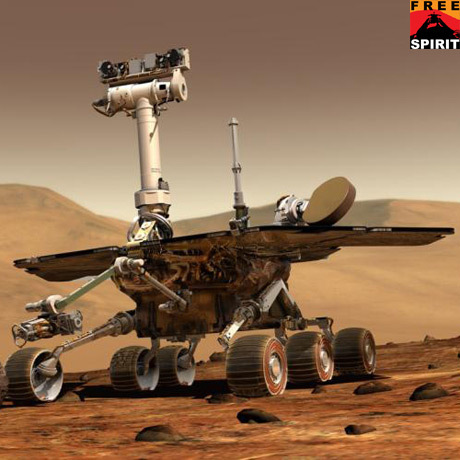 After driving into a sand trap in April 2009, the rover lost nearly all of its mobility and operators at NASA have periodically attempted to drive Spirit out of the trap with no success. Currently, the engineers are attempting to maneuver Spirit in such a fashion so that its solar panels will face northward for the coming Martian winter. With a northern tilt, the rover can gain more power through its solar panels and remain operational. Spirit’s mission was originally supposed to be 90 days, but the little rover has been performing scientific research for the last six years, far beyond its original mission parameters. Two years into its mission, the right front wheel stopped operating, and the rover pushed forward with only five operable wheels. In late November of 2009, six months after the rover was rendered immobile by the sand trap, the right-rear wheel stopped working as well. With only four full functioning wheels, the rover is in a spot of trouble. However, there is an upside to the rover’s immobility. Steve Squyres, a researcher at Cornell University and principal investigator for Spirit and Opportunity, said “There’s a class of science we can do only with a stationary vehicle that we had put off during the years of driving…Degraded mobility does not mean the mission ends abruptly. Instead, it lets us transition to stationary science.” Possibly the most tantalizing opportunity presented to the researchers at NASA is the ability to study the planet’s core, and determine if the core is solid or liquid. “If the final scientific feather in Spirit’s cap is determining whether the core of Mars is liquid or solid, that would be wonderful — it’s so different from the other knowledge we’ve gained from Spirit,” said Squyres.